Darac Kola has lived for close to a hundred years without finding his true mate. Having grown increasingly volatile, he knows his days are numbered. To protect his friends and family, he leaves Zerconia, knowing he will never return. Then he meets Willa. His mate. The one person who could pull him back from the edge of madness. With five brothers, Willa Sanchez has spent her life trying to be one of the boys. 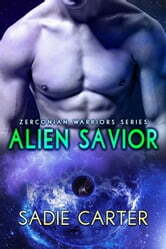 The last thing she needs is an overprotective, bossy alien claiming her as his mate. If he thinks she’s going to give up her independence to play house for him, then he’s got the wrong girl.